Hunger doesn’t happen just at Thanksgiving and Christmas when people are so generous with their food donations. Hunger is year round for many people in our community and one local church is actively helping to fill the need. 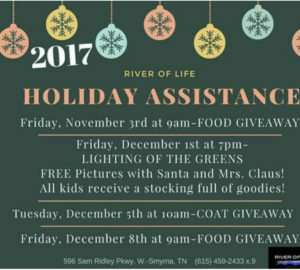 TOMORROW (Friday, November 3), the River of Life Church will hand out food starting at 9:00 a.m. No identification card is required, no registration. You can drive up and volunteers will bring the food to you. If your need is there, there are kind people ready to help. River of Life is located at 596 Sam Ridley Parkway behind Panera Bread. Many thanks to the kind people of River of Life Church.